"Hey Popeye! How's your spin-nage?" 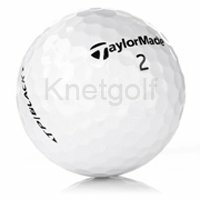 This is what you need to ask yourself when looking at this golf ball. One of TaylorMade's premium golf balls, the Taylor Made TP Black has more spin than the TP Red. Both balls are designed for lower handicappers with high swing speeds. This ball is a multilayer ball with three pieces, a soft core, a mantle layer, and a Uerathane cover. It is identical to the TP Red with the exception of an additional second soft mantle layer that is contained in the TP Red. That extra layer is designed to reduce spin on short irons. These TP balls are "players" balls and are TaylorMade's version of the Titleist Pro V1 and Pro V1x. All of these balls are designed for distance off the tee and a soft feel with the irons and around the greens. I would recommend the TP Black for those players that want to be able to work the ball more and spin the ball on the green. This ball will give you tremendous playability and control. Be careful though, because if you have forearms like Popeye's, you may just spin the ball right off the green.